When Tea traveled to China, we discovered the secret of shuangxi, a symbol that means “double happiness.” The motif is made up of two matching Chinese characters that mean“happy, happy.” We love the idea of good things coming in pairs! Sometimes more really is better, especially in wintertime. Stripes and florals, leggings and hoodies—if one style or color option is good, two are great! As the days grow shorter and the wind blows colder, double up on your Tea favorites and take a bit of the world with you wherever you roam. Let her shine in cozy stripes and swishy florals. Long sleeve dresses look great with warm socks and winter boots. Fine-wale corduroy tunics and dresses are velvet-soft and perfectly cozy for wearing on winter days. S WEET SWEATERS Falling temperatures are the perfect excuse for new striped pullovers and sparkly cardigans. Tea stylists do the mixing and matching so you get multiple outfits for one really great price. Multiple outfits put together by our stylists give you double (or triple) the options for one really great price. 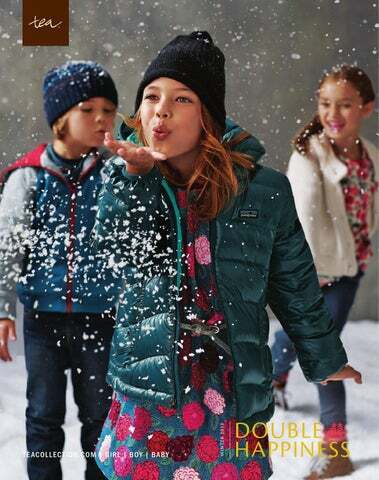 These colorful down jackets and vests from Patagonia are a fun and cozy complement to Tea outfits. Keep them warm to the tips of their toes with boots from Naturino, Kickers, Blundstone, Palladium and Umi. HOLIDAY The holidays are just around the corner. Get ready to glow. Dress up for holiday card photos, the big Thanksgiving dinner or just because it’s fun to get fancy. Going to grandma’s house or hanging out at home, casual holiday looks are full of style. Chasing dragons or building snow forts, he’s ready for anything in cozy Tea style. Long sleeves, sweaters, hoodies and graphic tees. Mix, match and pile them on. Get multiple outfits at one really great price and his winter wardrobe is all set. New long sleeve gowns and cozy two-piece PJs are the stuff dreams are made of. The Global Fund for Children gives millions of dollars each year to nonprofit groups that advance the dignity of children around the world. A ll pr o c e e ds f r om t he pur c has e of t he A nimal P uz zle and F our Se as ons pajamas go to supp or t t he wor k of t he G F C .
Combed cotton is brushed inside for extra softness. 2–12yrs. Combed cotton is brushed inside for extra softness. All pajamas have a slim fit that conforms to 16 C.F.R. 1615+1616. 6mos–12yrs. THE SWEETEST THINGS For the littlest citizens, soft and cozy styles in sweet Eastern-inspired prints. Destination.China. 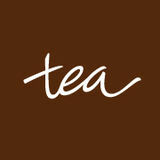 Tea Collection's Winter 2013 collection.